I’m sure that we all agree, that the turkey the sun that the whole roast-meal revolves around! Traditionally, turkey is stuffed with breading and served with sausages, bacon and all kinds of complicated trimming. Well this recipe is beautiful in it’s simplicity. 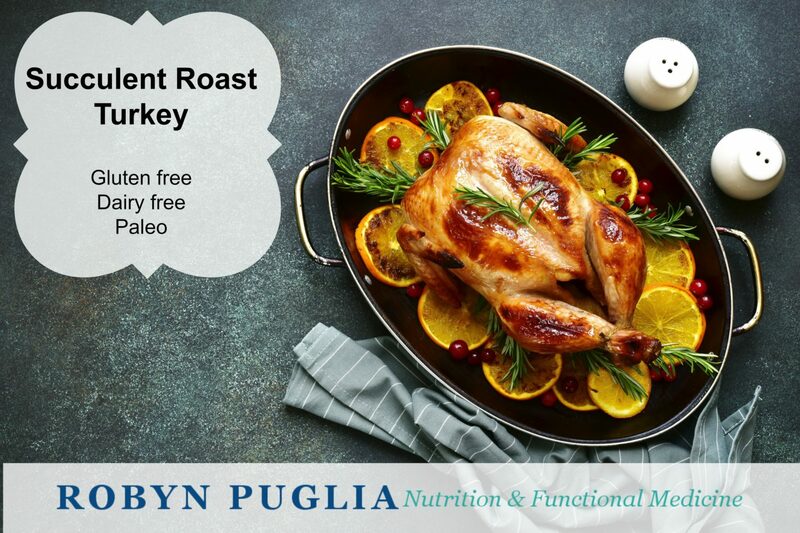 The flavours from the herbs and the orange infuse the bird perfectly and cooking the turkey upside down allows all the juices to absorb into the breast, transforming what can be very dry meat into a succulent, delicious dish. It doesn’t need to be dressed up and hidden, instead it pairs with all the vegetable sides and Triple Berry Cranberry sauce to create what I am SURE you will agree, is your best ever holiday meal! And of course it’s gluten free, dairy free and healthy as well as delicious. You could easily make this for every Sunday dinner or special occasion throughout the year. Put the stuffing in the cavity of turkey. Mix coconut oil with herbs, salt and pepper and massage over whole turkey. Place turkey, breast down, in a roasting tray and add 200ml of water in the tray. Cover with baking paper and then foil so that the foil doesn’t touch the meat. Adjust the cooking time according to the instructions below. For the last 30 min turn the turkey breast up and uncover in order to brown the breast.